So, remember when we said bulbs with wireless radios are the future of lighting? We weren't lying. Philips just upped the ante by making bulbs that can not only cast four gorgeous shades of white, but any color you can imagine. Hue works similarly to the Greenwave system we wrote about last week. Screw in the bulbs (you get three in the starter kit), plug a gateway into your wireless router, then install an app to your iOS device. The Android version will be ready in December, and you can control it from your home computer via the Hue website in the meantime. The biggest difference is that while Greenwave can only fade up and down, Hue can change to any color of the rainbow. It has four pre-set shades of white for different purposes: Energize, Reading, Relax, and Concentrate. For all being "white" they are dramatically different and pretty effective. Energize and Concentrate are both cool temperatures, and made me feel more alert, while reading is more of an incandescent yellow, and relax adds some mellow red. They're plenty bright and cast extremely evenly. These are the modes you'll probably use most often. But when you start playing with colors, that's when things get crazy. You know that amazing sunset you took a picture of that one time? Wouldn't it be cool if you could light your room with those same colors? Yeah, you just upload that photo into the app, and choose the point on the photo you want to sample the color from, and your lights change to it within seconds. But there were reds and yellows and blues in different parts of the sunset? 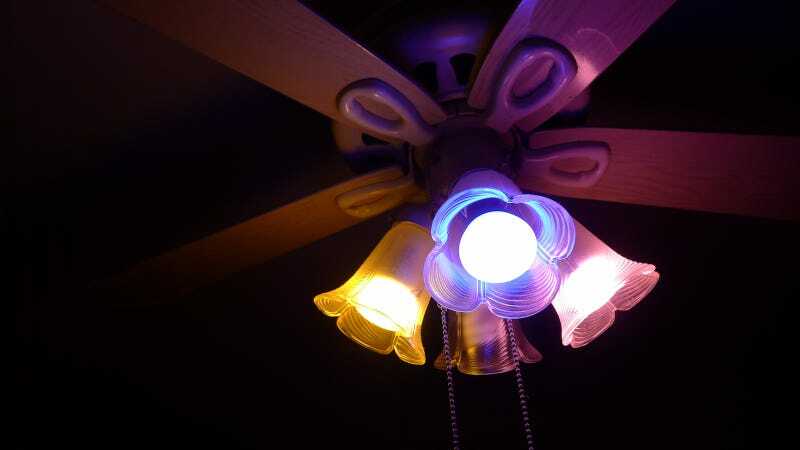 That's cool, you can have each bulb take on a different color from the photo. I would have assumed it was malarky if I hadn't seen it myself (and if I weren't playing with it right now). The bulbs themselves are actually really good looking. They don't have fins or those ugly faceplates that a lot of other LED bulbs have. Actually, they just look like plain old lightbulbs. Inside, they're anything but. The bulbs have a wireless radio that operates over the ZigBee Light Link protocol, meaning they'll be able to interface with other "connected home" systems. Each bulb has 11 LEDs within it, which is how they do their chameleon tricks. The bulbs are 8.5 watt, which makes them roughly 80 percent more efficient than comparable incandescents. Philips says they're good for 15,000 on hours or 15 years (whichever comes first). One of the most exciting things about Hue is that Philips is really reaching out to the developer community and releasing the API. There's a ton of potential there. An app could use your phone's mic and have your lights pulse with your music, or change colors with a game you're playing. Filip Jan Depauw, Senior Global Director at Philips (and godfather of Hue), told me he had someone whip up a simple app that would send him an email if his elderly mother hadn't turned on any of her lights by 10am, so he could check in on her. While that specific functionality won't be built in to the Hue app (though anyone could make it), in 2013 the app will support geofencing, so your lights can turn on as you get home. It already has has timer modes built in, and some cool social features, so if someone creates a profile you really like, you can grab it (or share yours with friends).